The MicroLite series of miniature wearable reference microphones from AKG by HARMAN is designed for broadcast, theater, and conference applications, and includes lavalier, ear-hook, and headworn options. The LC81 MD is the smallest cardioid lavalier microphone on the market, featuring a diameter of 4.8 mm, a length of 10 mm, and a weight of 2g. The microphone’s sensitive cardioid polar pattern picks up a wide range of frequencies and provides flexibility in getting the best sound from the source. 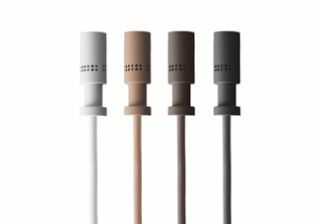 The microphone is available in four colors. The LC82 MD omni-directional lavalier microphone has a diameter of 3 mm and a length of 6.5 mm, making it one of the smallest omnidirectional microphones in the world. Ideal for musicals, theater, churches, broadcast, and large-format presentations, the LC82 MD also ensures that moisture and makeup won’t dampen a performance. Like the LC81 MD, the LC82 MD is available in four colors. Similar to their lavalier counterparts, the EC81 MD and EC82 MD ear-hook microphones provide additional options for wireless sound. Each microphone offers a flexible ear-hook and adjustable boom length for guaranteed comfort, while users can choose between a cardioid (EC81 MD) or omnidirectional (EC82 MD) model. The EC82 MD also features a highly moisture-resistant design. Both microphones are available in two colors. For those who prefer an even more stable fit, the HC81 MD and HC82 MC omni-directional headworn microphones deliver sound in cardioid and omni-directional formats, respectively. Featuring flexible ear-hooks and an adjustable boom, they both make it incredibly easy for wearers to customize the fit to their liking. Each microphone is available in two colors, and the HC82 MC features a moisture-resistant design. All MicroLite microphones feature a cable with a Microdot connector, which is compatible with a variety of different connections, as well as all major manufacturers of wireless microphone systems. This provides the flexibility to integrate the MicroLite microphones into a variety of environments, and customize the system for optimal performance. They are also a complement to AKG wireless systems such as the DMS800, and can be easily integrated with products from other HARMAN brands.